We Turned it on so our lovely midwifes and nurses could learn how to Switch it off! We ‘Turned’ it on so our lovely midwifes and nurses could learn how to ‘Switch’ it off for one of our ‘Turn it on Switch it off’ stress coping training days. We were joined at Hinchingbrook Hospital by ladies from far and wide to take part in the day. The day was focussed on who you are not your job tittle and that’s really important because you don’t need more training on how to do your job. We recognise, with all our training courses, that if the individual behind the job title is in a good place, everything else falls into place. We spent the day teaching the delegates anchoring techniques for themselves and the people they look after, how to find a really positive state of being, and to anchor that state for whenever you need it. For some that was a state of calmness, for others it was a confident state, but as with all we do we make sure its about the individual. 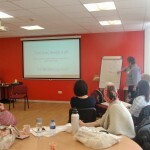 We also taught some NLP stress relief techniques which again could be used by the individual or utilised within their work with their patients. This included techniques for noticing what it is that stops you doing or being the version of you, you would wish to be and how to find ways to change those road blocks into stepping stones! 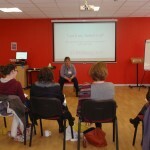 The afternoon was all about communication, as often poor communication is the basis for stressful situations to arise. By the end of the afternoon everyone in the room was reading eye patterns, noticing language patterns in others and mirroring body movements that all lead to a much greater ability to build report. The day was rounded off with a mindfulness session to bring all the learning from the day together and specifically designed around anchoring the perfect state for each individual in the room to be the best version of themselves. 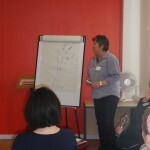 The evaluation forms that provide us with feed back for the day were fantastic. Everyone left in a much better place with new skills to get them through their days at work and play. And yes ladies , we will be doing more in the very near future.